With the economy crunch this year I've been trying to save on utilities as much as possible. One day I was sitting outside in the middle of summer and you could almost cook an egg on the sidewalk....so I thought why not! I looked on-line and sure enough it is possible to cook using nothing more than the sun. To my surprise there are countless thousands of people around the world that rely upon the sun for cooking. My budget is really tight so whatever I made had to be cheap or use whatever I had on hand. After searching the local thrift stores, I came across a bunch of parts to build an oven. The oven compartment is small, but what the heck it is just a test right now. I'm still working on improvements and will eventually make one with a larger oven compartment. I mounted a small metal table with an aluminum box onto onto a roll around frame with hinges. I insulated the box and lined the interior with aluminum foil. Then I installed a cooking rack with wire so that it would allow the cooking vessel to tilt as the oven did. The lid is a picture frame with glass and a screw so the lid can be removed. The greatest heat loss I've had so far is from the lid and it will need further refinement. The tilt control is also crude with carpenters clamps and metal plant hangers. I then mounted a plate to the backside of the lower frame to serve as a counterbalance in case the weight was too much as the oven was tilted. The reflectors were initially aluminum foil and cardboard, but I've since upgraded to wooden paneling and reflective emergency blanket material because of its reflective ability. There are still lots of improvements that I need to do, but I'm on a shoe string budget and this oven works okay for now. So far I've done baked potatoes, pork ribs, and beans. Now I'm tempted to build more ovens for additional cooking space so that I can do an entire meal at once. The wife is impressed now and wants to make cakes, so that's what I'm shooting for. Hey James,that's great; that you were able to come up with an effective cooker just using common household materials to build; from what it sounds to me, a nice, functioning solar oven. This will definitely show those who are new to solar cooking that it doesn't take much to achieve satisfactory solar cooking results with inexpensive materials and a bit of ingenuity, as you were able to demonstrate. Good luck with your other solar cookers, and please do share them with the rest of us, as well as any recipes that you would like. The more the better, for all of our visitors. texture; similar to Mrs. Fields.Tasted good too; I have no idea if homemade recipe or bought dough, but the texture was perfect. They told me the oven reaches 400 degrees, so anything would cook in it. eyes: free energy, great cooking potential. 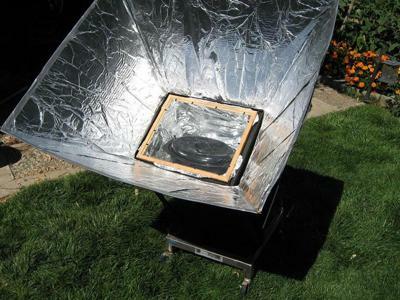 You incorporated all of the right elements into your solar oven. Love the design. It should serve you well. As for being tiny...not a problem when you build another and another. I often have three solar ovens of various designs, sitting in the sun at the same time. One has the meat, the other the potatoes, and the maybe another has desert (i.e. brownies).